Multi-strain probiotic and lactic ferment complex (8 strains). Each capsule contains 10.5 billion active cells, concentration guaranteed until expiry date. The medical and personal life situations can test your immune system... and your digestive health. The link between the brain and the intestines is undeniable, so that the cognitive functions affect the digestive functions, and vice versa. When stress occurs in one or the other of these systems, the intestinal microbiota is weakened... with direct consequences on the entire organism. Our powerful and complete formula contains 10.5 billion active bacteria and no less than 8 different human strains. We are what we eat... and digest ! 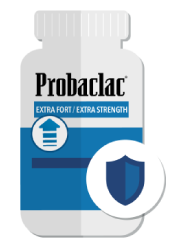 HOW TO TAKE Probaclac Extra Strength ? 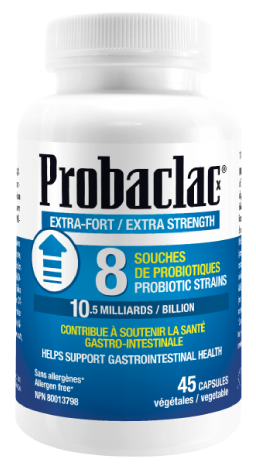 Probaclac Extra Strength is a formula suitable for any type of person suffering from acute problems in the intestines. It acts quickly and effectively against these thanks to its high concentration and the amount of different strains thus allowing complete coverage of the intestinal tract. It is also very effective in cases of antibiotic therapy. What is the ideal concentration of a daily probiotic ?